38-year-old Malinda found out that she was pregnant after being told that she could never conceive and bear a child. Because of significant health challenges, she was advised to terminate the pregnancy, but she was determined to bring her child to life. She had a premonition that she wouldn't survive the pregnancy, and she told the baby’s father: “I'm not going to make it. You’re going to have to fight for our child.” When Malinda and Chris discovered that they were expecting a boy, they decided to name their son "Christopher Ruben" as a namesake for Chris, the dad, and Ruben, Malinda's father. 21 weeks into her pregnancy, Malinda suffered a massive stroke. After placing her on life support, the doctors declared she was beyond medical hope of recovery. Devastated by this news and the sudden grief, the family requested that the hospital keep Malinda on life support in an attempt to save the baby and bring Christopher Reuben to a safe point of delivery. This had never been done before in the State of Idaho. The hospital had no experience to draw on, and sought a transfer to another medical center that might be more suited to the case. Turned down by four other hospitals, a team of doctors at St. Alphonsus in Boise bravely ventured into uncharted territory, honored the request of the family, and pledged to do everything in their power to save Baby Christopher. When family members reached out to Stanton Healthcare of Boise, we came alongside the family to provide support. Their greatest need was prayer, and we quickly mobilized a prayer chain that soon had people around the world interceding for Baby Christopher. In addition, we were able to share information on how people could donate to help alleviate the mounting financial burden of the family. On Sunday, February 4, we organized a Prayer Vigil for Baby Christopher on the property of the hospital and over a hundred family, friends, and members of our community came to show their support for Baby Christopher. Faith leaders and civic leaders alike offered up prayers for Baby Christopher who had reached the 23 week milestone only the day before. Less than five hours later due to declining oxygen levels, the doctors made the decision to deliver Baby Christopher Ruben. He came into the world with a cry that could be heard out in the hallway much to the surprise of the staff for a 1 lb. 1 oz. little guy! Our little miracle is now in the NICU where he has a long road ahead of him. He's shown good grip, squeezing his grandmother's finger. And he is drinking milk, even peeing on the nurses a few times! And yet, while we celebrate and continue to intercede for Baby Christopher, our hearts break for his family as they are making arrangements for a funeral. They welcomed one life into their family and said goodbye to another. 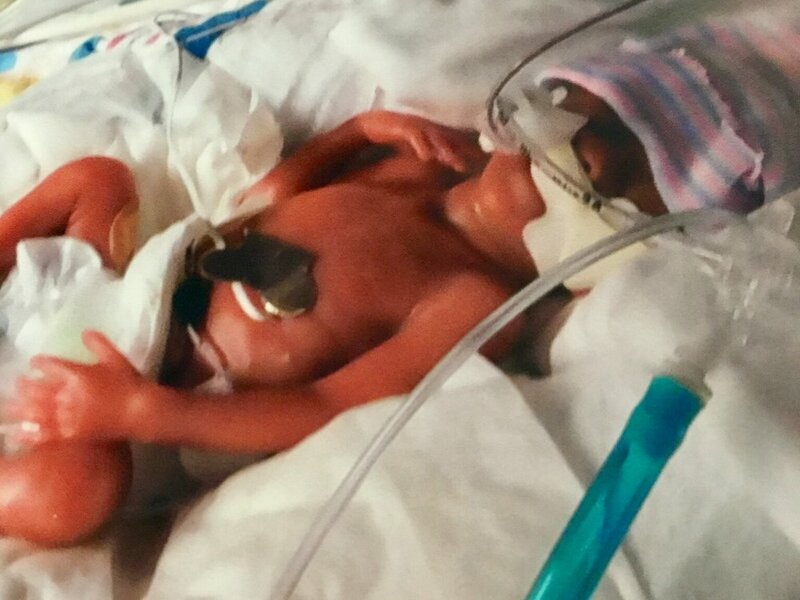 We continue to pray for strength and health for Baby Christopher, and we pray for comfort and grace for his family. On Sunday evening, Christopher's grandfather, Ruben, remarked to me that his grandson was a "Super Bowl baby". I thought that was pretty cute. I guess Super Bowl Sunday will always be special for Christopher Ruben growing up. He is a Super Bowl baby. And Malinda is a superhero mom--a mother who bravely sacrificed herself for her child--who in death, incubated her son to life. This is not just a historical medical case or a most noble cause. This is a child. This is a son, a grandson, a nephew, and a cousin. This is one of us. This is a mother's legacy. And we honor her sacrifice. You would think that racial bigotry would have ended with the victories of the Civil Rights Movement in the sixties. But it doesn’t take a degree in sociology to understand that racism remains a scourge in our society today. From Charleston, South Carolina to Charlottesville, Virginia, we’ve seen more than our share of racial strife in the news. There are some who choose to ignore this problem, pretending it doesn’t really exist, while others exacerbate it by leveraging tragedy for political profit. The first group are like firefighters who ignore the call of a home on fire. They justify their lack of response by looking at all the intact undamaged homes across the city and declaring, “We don’t have a fire problem!” The second group are like firefighters who show up on the scene but instead of dousing water on the flames, they pump gasoline through their hoses accelerating the destruction of the house. What is the answer to all of this madness? As is often the case, the answer is right in front of us, found in the most unlikely of places. 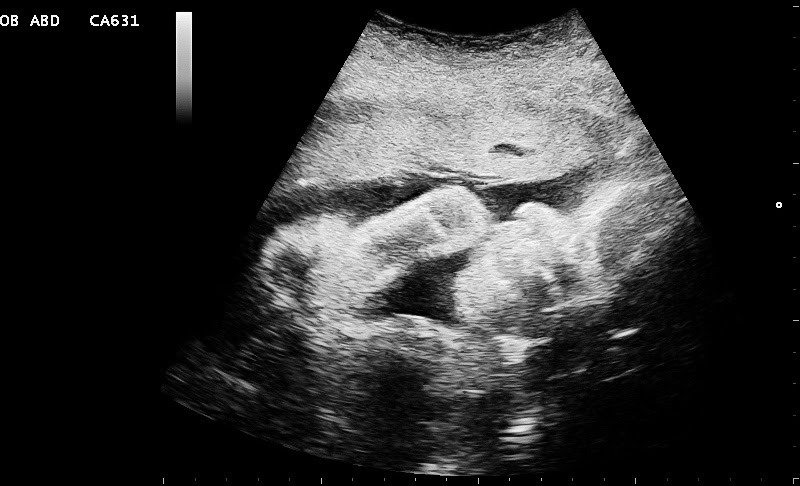 Every single week, expectant mothers come into Stanton Healthcare of Boise to get an ultrasound of their baby—an ultrasound that is provided free of charge thanks to the donations of our generous supporters. The ultrasound is such a beautiful marvel of technology that speaks volumes about philosophy, theology, and at a deeper level, our own humanity. The monochromatic screen does not reveal skin color, race, ethnicity or religion. It doesn’t predict the place of birth, social status, or degree of education. It reveals form and substance. Fingers. Toes. Heartbeat. Head. Nose. Mouth. Substance with DNA and a living soul. Everything that we have in common with our fellow man. On this screen black or white is black and white. We see a shared image—the image of our Creator God. And looking at this image we imagine. We imagine possibilities and potential, lengthening the list of what we have in common. Everybody has a future. It is up to us to determine what kind of future that will be. At Stanton we are creating a future of hope and peace. This year alone Stanton Boise has performed over 200 ultrasounds on clients with 68 babies born and counting! Your partnership with Stanton allows us to project hope and purpose to a world where senseless violence and tragedy has become the norm. Together, we are conquering hate one life at a time. BOISE, Idaho, March 20, 2017 /Christian Newswire/ -- A mobile mammogram unit will be seeing patients at Stanton Healthcare on Tuesday, March 21 from 9:00 A.M.-2:30. Stanton is located at 3684 N Harbor Ln, Boise, ID 83703. Stanton is a life affirming women's clinic based in Boise, Idaho which has affiliates across the nation and in Belfast, Ireland that provides quality health care to women with a special focus on women facing unexpected pregnancies. Stanton's goal is to provide the highest standard of care to both mother and child as they work toward replacing Planned Parenthood with clinics that are focused on true women's health care and not abortion. "Stanton Healthcare is delighted to partner with one of the finest hospitals in our region to provide mammograms as part of our wellness and prevention program. We have invited them to bring their mobile mammogram unit to our center to provide this essential service to women. "This is another major step in our goal to replace Planned Parenthood with clinics that provide true quality women's health care and not abortion. "As the federal government moves to defund Planned Parenthood, it is critical that we replace them with clinics that are not abortion focused and don't treat women as a commodity. Rather, we must embrace both women and their children and provide them with life affirming quality and compassionate health care choices. Stanton is leading the way in providing compassionate and professional care that treats all with dignity." "Stanton Healthcare is excited to partner with one of Idaho's leading hospitals to offer mammogram screenings to the women of the Treasure Valley. At Stanton, we believe that caring for women through all stages of life is essential. Preventative services such as mammogram screenings empower women to be proactive in their health and well-being. By offering our services at little to no cost for our clients, we are showing the way forward in offering holistic, compassionate and quality women's healthcare. "As a registered nurse and woman, I am incredibly grateful for the services that Stanton provides. It is the kind of health care that women truly deserve because it celebrates and values women and their children and does not treat them as property." A new pregnancy center in Idaho plans to break ground this spring on a plot next door to a Planned Parenthood abortion clinic. Stanton Healthcare founder Brandi Swindell said they hope to be operating their new facility in Meridian by early next year, according to Meridian Press. They plan to break ground in May, she said. “It’s going to be set up and designed to offer holistic women’s health care, as well as our specific care to reach out to women facing unexpected pregnancies,” Swindell said. Swindell said the new facility will offer free ultrasounds, pregnancy confirmation, uterine and ovarian diagnostics, STI testing and treatment, prenatal care and postnatal follow-ups and possibly mammograms. The building will be 7,000 square feet and cost about $1.4 million to build, according to the report. It will have exam and counseling rooms, a laboratory, wellness room and boutique for infant and maternity clothing. The group hopes the Meridian facility will be the flagship model and training center for its future facilities. Swindell said she began the healthcare group as a life-affirming replacement to Planned Parenthood. Planned Parenthood leaders in Meridian are not happy about the new Stanton facility being built next door. In December, the abortion chain filed a lawsuit against Stanton Healthcare, claiming its volunteers are harassing Planned Parenthood patients. Stanton Healthcare and Planned Parenthood, which are facing off in a lawsuit, could be neighbors in Meridian by early next year. Stanton aims to break ground on a new Meridian wellness center in May, pending city permit approval, said founder and CEO Brandi Swindell. The 7,000-square-foot building would be at 2218 E. Franklin Road, next to Planned Parenthood. Stanton owned two parcels at the site and sold one to a church, Swindell said in December. Stanton’s mission is to end abortion and provide free services to women facing unexpected pregnancies. The organization has opened pregnancy crisis centers next to Planned Parenthood’s other two Idaho clinics in Boise and Twin Falls. The regional Planned Parenthood sued Stanton Healthcare in November, claiming Stanton illegally operated its mobile services van in the shared Meridian parking lot and intimidated Planned Parenthood’s staff and patients. Swindell has called the lawsuit’s claims false and slanderous. WASHINGTON, Jan. 18, 2017 /Christian Newswire/ -- Stanton Healthcare which was initially accepted as a "Partner" for the WMW, has now been removed by march organizers. Stanton provides quality healthcare free of charge to low income women, women with unexpected pregnancies and the refugee communities. With other women's groups that embrace a pro-life message being removed from the WMW, it is now clear that this is not a "Women's" March at all but an anti-Trump and pro-choice march. "As a single woman who started a women's healthcare clinic and a pro-life feminist, I think it is important that there is inclusion, diversity and a broad spectrum of opinions at the 'Women's March on Washington. "That is why we thought it was so important to mobilize women who embrace ending the violence of abortion and standing for human rights and justice for all. "If the voice of pro-life women is excluded from the WMW, then it is not really a 'Women's March' at all. Rather, it is an anti-Trump march, a pro-choice march or a Planned Parenthood march. To truly be called a 'Women's March,' all our sister's voices, thoughts, viewpoints and stories need to be heard. "Let's be clear on this point, the WMW has turned into a purely partisan political rally and march with no regard for hearing from or listening to all women's voices. Shame on them for using the term 'women' to advance their political agenda." WASHINGTON, Jan. 17, 2017 /Christian Newswire/ -- Stanton Healthcare, a pro-life women's health clinic, received confirmation of their acceptance as a partner in the WMW today and is listed on the official March's website (see below). Stanton Healthcare provides quality healthcare to women with unexpected pregnancies, low income women and the refugee community all free of charge. "Stanton Healthcare can mobilize women to attend the march who will embrace human rights and social justice for all while standing against the violence of abortion. They will also encourage women to participate in the march who will challenge the federal government to defund Planned Parenthood and give that $540,000,000 to federally licensed health clinics that provide more comprehensive women's health care services." "If the voice of pro-life women is excluded from the WMW, then it is not really a 'Women's March' at all. Rather, it is an anti-Trump march, a pro-choice march or a Planned Parenthood march. To truly be called a 'Women's March,' all our sister's voices, thoughts, viewpoints and stories need to be heard. Hopefully, Stanton Healthcare will be allowed to stay." Pro-life women will participate in the Women’s March on Washington later this month, sending the message that the anti-Trump and pro-choice narratives pushed by the event’s organizers do not speak for all women. Representatives from the Stanton Policy Center, And Then There Were None, Sound Legal Group and other pro-life groups are planning to attend the Jan. 21 march. “As a woman who has spent most of her life standing up against injustice in the world and promoting the dignity of women and the sanctity of every human life, I am thrilled to be a part of the Women’s March,” Brandi Swindell, founder of the Stanton Policy Center, said in a statement. WASHINGTON, D.C. – Stanton Policy Center, Sound Legal Group, and other pro-life groups from across the nation will participate in the March for Women in Washington, D.C. on January 21st, 2017. The groups will gather at the Supreme Court of the United States at 9am ET on January 21st, 2017 and walk to the March for Women rally together. Full details can be found here. Catherine Glenn Foster, Civil Rights Attorney and founder of Sound Legal Group said: "The Women's March on Washington claims to be about human rights, nonviolence, and confronting injustice. But by accepting Planned Parenthood, NARAL, and other abortion activism organizations as co-sponsors, the Women's March on Washington has betrayed its mission and failed to confront the injustice in front of its face. Human rights and nonviolence apply to everyone, regardless of age and disability, and are most powerful and most urgent when serving those who need it most. It's time for the Women's March to speak up for all women." The New Complaint Campaign of Planned Parenthood & Co.
As she drove by A Preferred Women’s Health Center on her way into work Friday morning, Tonya Baker Nelson noticed what she sees too many mornings: a parking lot full of cars—every one of them representing a woman ending her child’s life through abortion at the Raleigh, N.C., clinic. Right next door to the clinic stands the house Baker Nelson’s pro-life pregnancy help organization purchased a year ago in hopes of offering each of those women one last chance to save her child’s life from abortion. A year into a protracted battle to rezone the residence into a life-saving outpost, Baker Nelson will need to clear one more hurdle after the abortion business filed a complaint with the city three days after Christmas in a last-ditch effort to stop the pro-life site from opening. It’s a story that sounds eerily similar to Brandi Swindell, the founder and CEO of Stanton Healthcare, whose relocation effort next to a Planned Parenthood mega-center in Meridian, Idaho prompted the abortion giant’s Great Northwest and the Hawaiian Islands regional affiliate to file a suit against the pro-life nonprofit in November.